Oatlands Handmade proudly supports the Save the Tasmanian Devil Campaign with a number of handmade products, the sale of which donates a portion of profits to the Appeal. We stock Tassie Devil Cigar Box Guitars, Tassie Softees from Willowtree Farm, and also have beaut Devil brooches, pins and bags from Tasmanian Handmakers. 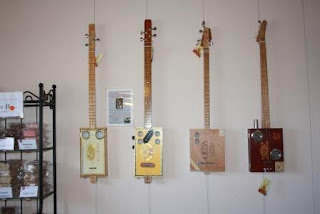 Tassie Devil Cigar Box Guitars from $170 - $240. Affordable musical fun! !